Tony, Tony, Tony, Tony. When I was a Trot I had it drilled into me that you don’t necessarily speak for yourself. You always have to think about how your conduct and the positions you’re arguing might reflect on your comrades. This sense of political self-responsibility, I think, is something of a virtue and my many, many blogs (I hope) abide by this rule. When finger tips touch the keyboard, there is a sense of trying to say something that others might find helpful. Political argument, after all, is about arguing with purpose. With that in mind, what were you trying to achieve with your recent comments? As you were once so fond of saying, I get it. Jeremy Corbyn isn’t the man for you. You believe his route isn’t the path to power, and that a government with the kinds of policies he favours would be a “dangerous experiment“. There are two points worth making here. First, a bit of humility would be in order. Your tenure saw you undertake a reckless experiment with the Middle East. Despite repeated warnings at the time, you ploughed ahead with your friend George W Bush – who at least has the good grace to keep his mouth shut – and helped set in train a series of events that led to the formation of Islamic State. Even without that unhappy consequence, an Iraq riven with sectarian tensions and regular suicide bombings is your legacy, and you deserve to be dogged by it until the end of your days. Whatever may happen should Jeremy Corbyn make it to Number 10, he is most unlikely to leave it with the deaths of at least 250,000 people searing his conscience. The second point is a matter of the burden of proof. 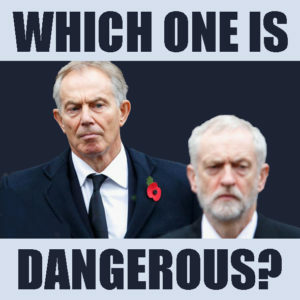 How would a Jez-led Labour government be “dangerous“? It’s not enough to boldly advance a position, you need to back it with solid argument. Where is the danger when all wings of the party are pretty united on matters of economic policy. The leadership believe the state should take an activist role vis a vis the economy, a position shared by even Peter Mandelson. On public services and social security, the leadership is committed to no more cuts – a policy that has (in words at least) been adopted by the Tories. It wants to see more houses built, a life-long education service introduced, the removal of the market from the NHS and its integration with adult social care, a devolution of powers to local authorities, an increased minimum wage. I’ve looked among these pretty mainstream Labourist aspirations, and can’t see where danger threatens. Are we instead talking about foreign policy and military spending? On the European Union Jeremy has swallowed his well-known scepticism and has made a strong case for staying in. Is that going to change in a government led by him? Absolutely not. How about withdrawing from NATO? Again, most unlikely. And Trident? As a member of NATO Britain would remain under the US nuclear umbrella, a point Nicola Sturgeon hammered home for Scotland time and again whenever it raised its head in the independence referendum. And is scrapping Trident necessarily that insane considering the military brass themselves are divided on the merits of its renewal? Come on Tony, you might as well say it. By setting your face against this policy agenda, you’re setting your face against a mild social democratic programme. That doesn’t affect you, of course. There’s nothing you can say and do to win those over appalled at your behaviour during the Iraq crisis, and your downright disgusting activities spinning for Nursultan Nazarbayev, the dictator of Kazakhstan, since leaving office. Yet you are oblivious to the whirlwind your remaining friends in the party reap every time you open your trap. Your chums in Progress are too polite (and star struck) to tell you to can it, but every time you say something you make their project that little bit more difficult. Perhaps your arguments would be better received if they articulated something, but they do not. For instance, you say that the centre ground needs to get its mojo back. What does this vapid nonsense even mean? The “centre ground” isn’t some independent political force. You always previously understood it as a zone where the policy and value preferences of the majority of nice middle Englanders in nice middle class swing seats were located, and your strength lay in your appeal to those yearnings and prejudices. Secondly, the centre ground just doesn’t exist. Even if we define it in terms of where the majority of views are clustered on a given set of issues, what is left is an almighty mess. For instance, according to Jon Cruddas’s latest iteration of his working class conservatism hobby horse, most people believe the economy is skewed towards the interests of a powerful elite. Yet the same research (which isn’t without its problems) also says austerity was “popular” and the reason we didn’t win the election. Where’s the centre ground here? The blessed Ed tried, oh he tried. On every issue, our policies had a go occupying the centre ground by pitching in terrain equidistant from an old school Labour position and that of the Tories. This was a recipe for incoherence when clarity was needed. And for following your playbook, you weirdly castigated Labour for being “too left-wing“. There is also the small matter of politics shifting and new realities coming into play. When the situation is one where the main parties of the centre left and centre right are eroding as their natural constituencies are dispersing, the view that the beloved triangulation of old, which depended on taking core votes for granted is a go-er is a recipe, frankly, of accelerating that process. It’s no secret that I’ve never rated you as a strategic thinker, a figure of substance, or even a politician who can do the professional politician things. Winning three elections against hapless opponents isn’t genius; it’s good fortune. You had an opportunity after the premature passing of John Smith, and you took it. Yet you remain a creature of that moment. Now, politics is a lot less certain than it was when you ruled the roost, every time you pronounce on this or criticise that you show yourself up as a man out of your time. I know you can’t help yourself, but those old times are never coming back. Even if the Labour centre or the Labour right win back the leadership, the times they have a-changed and it’s up to the party to deal with things as they are now, not how you perceived them to be 19 years ago. Tony Blair in his memoirs (page 635/6). Yes Yuppie Blair the man who brought us the Iraq War and possibly the greatest foreign policy disaster ever and cost 250,000 lives and still the political imbecile and apologist for Khasakhstan (which also funds Progress) tries to lecture us. When tragically John Smith died there was a middle class New Labour coup in Labour and the rest is history. So Blair brought the private sector into the NHS, brought in PFI which we are still paying for, neglected working class communities leaving a vacuum for others to try to fill. The man who destroyed Labour in Scotland and probably most of the Labour parties in Europe who were foolish enough to copy him. Hopefully we will be a danger to Blair’s pet project – Neo-Liberalism. ‘The great men and women of history’, blissfully unaware that history has passed them by. I think Labour is in a good place now; it has its soul back! All very true Phil. However Tony Blair and the superrich class his views represent ( as well as the significant numbers in the PLP for whom “politics” is simply an opportunity to build up corruptly offered favours whilst in office – ready for personal sinecure jobs payback when out of office ), really do see even a mildly radical Left Keynsian anti austerity Labour Party in office as a direct threat to their interests , and Global Austerity narrative. So much so that they definitely would unleash all the usual destabilising weapons, of currency speculation and capital flight, on a UK under a Corbyn Government. Look how quickly these tactics broke the initialyl mild Leftism of the 1984 Mitterrand government, or the initial anti austerity stance of the supposedly radical Left Syriza government. This just could be a more pressing issue than we on the Left initially thought. The utter disarray in the Tory ranks could just possibly trigger a General Election soon after the Referendum – as long as the vote is close – for In or Out. in this situation it is easy to imagine the pressure from the PLP and Party machine and Trades Union barons, for Jeremy to “stand aside” for a “less divisive/ less controversial” middle of the road PLP member to take over for a snap election (Andy Burnham perhaps ?). With the prospect of an utterly rebellious PLP sabotaging Labour’s chances in such a snap election, many Labour Party members might even buy into this capitulation (which the Labour Left has endless form for historically). The growing debacle in the Tory Party, and the matching utter PLP disarray could well spell a looming crisis for us on the Left – long before the 2020 deadline we have confidently assumed we had to work towards with our battle to transform the Labour Party Leftwards. Yes John bit pessimistic but worth consideration. Perhaps the left should do more forward planning and look at a risk assessment on this possibility. We should be proactive rather than waiting until it may happen and then being desperately reactive. This is why I always appeal to left wing democratic socialists in every country in the World to be fighting for the same things at the same time. I think peaceful left wing democratic socialists can win. -Removing the *internal* market can now mean the private sector running the whole thing (both the “commissioning” and “providing” sides). -Integrating a partially privatised NHS with mostly privatised social care will mean bringing in contributions from the latter to the former. That is what the likes of Simon Stevens and Caroline Flint are indicating and how could it be any other way? Only by renationalising social care, and is that on the cards? Not even the TUC will agree to that. -“Devolution of power to local authorities”. This is actually the current Tory banter. And in terms of NHS devolution, it means handing over the NHS budget to councils who routinely outsource services and who can use that budget for other things, and with 40% of cuts to their budgets, the temptation is included in the package. So what would be a danger for Tony Blair, specifically the corporate interests he and his followers represent, would be a *departure* from this Tory nonsense and a genuinely pro-NHS policy from Labour. There’s little danger of this from Heidi Alexander, but others in the party might offer such a promise. PBC makes the essential point that it is social democracy that he is opposed to, and largely succeeded in quashing when in power, replacing it with a form of liberalism.The Blairites have been on the defensive ever since – Miliband was bad enough, but Corbyn! If he is not going to give serious reasons why Corbyn is ‘dangerous’ can he please shut his mouth. Left wing democratic socialists should have ambition for the working class people/working people of the World. We should not settle for crumbs like the uncritical thinkers of the Labour Right and we should aim to eliminate global poverty & oppression. The self-proclaimed great men and women of history are also irrelevant and history has thankfully passed them by. Perhaps now is the age of the great mass of history. We just need to follow a grassroots, bottom up, participatory,left wing democratic socialist approach. We only have one life and in a World of extreme global inequality if you don’t really fight this then perhaps you may as well have never existed.